Vacuum forming is a process that is commonly used to create trays and inserts which are found in use throughout various different sectors. Regarded as a type of thermoforming, the process involves forming plastic into permanent objects. This is achieved by heating a sheet of plastic until it reaches forming temperature. Once this temperature has been reached, the plastic is stretched across a single-surface mould. A vacuum is then created that forces the plastic against the mould to create the desired shape. The process is not only quick but cost-effective too allowing for fast-paced bespoke production with minimal downtime. Trays and inserts are widely used in all manner of environments and are essential in situations where packed goods must be stored or transported. Storage solutions produced through vacuum forming adjust to the contours of the product providing unrivalled levels of protection from both breakage and surface damage. As such, vacuum forming is commonly used when critical packaging, such as trays and inserts, is required. The bespoke storage solutions supplied by CPP will not only ensure that your items are reusable but will also contribute to both cost and efficiency improvements. Furthermore, these solutions will keep items reliable and are environmentally friendly. Prototypes can be produced quickly and accurately saving you both time and money. 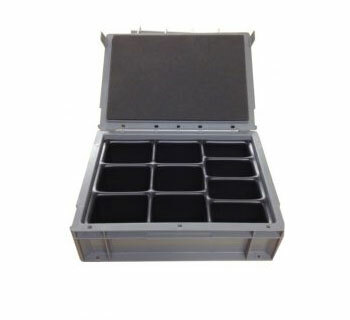 Here at CPP, we create custom-made trays and inserts for a whole range of applications. From surgical tools and dental equipment to aerospace instrument panels and automotive switches, each product is tailored to the client’s needs. Trays and inserts are produced to exacting specifications and are available in a selection of colours and finishes. Click here for the downloadable ‘Trays and Inserts’ PDF file. What sets us apart from our competitors is our unique approach to how we define and develop tailored solutions that provide our customers with exactly what they are looking for. This is an approach that we have carefully honed over the years. Through our dedication and drive to provide our clients with a competitive service, we have amassed an outstanding reputation. Regardless of how large or complex your project requirements are, you will find that we are more than up to the task. With a focus on fibre free, clean and renewable solutions we are committed to providing services to our customers that are environmentally friendly. So, if you’re searching for clever storage solutions, look no further than CPP.